Six Senses Zil Pasyon is located on Félicité, a private island where massive granite rocks and white sand beaches create an air of drama and beauty. Occupying less than one third of the total land, Six Senses Zil Pasyon is the sole resort on the island. It has 30 villas and will open a spa in February which has been erected in and atop majestic rock formations. The Zil Air helicopter journey to Félicité is just 30 nautical miles northeast of Seychelles International Airport (SEZ) on the country’s main island of Mahé. The 20-minute flight arrives at the resort’s own jetty helipad. Alternatively, arrive by a short boat trip from nearby La Digue and Praslin. 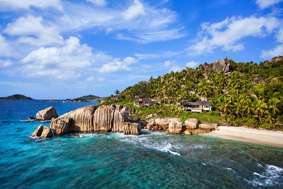 The Six Senses Zil Pasyon, the latest hotel to open in Seychelles, is already creating buzz. The luxury resort has been listed by the CNN Business Traveller as one of the top hot new hotels to look out for in 2017.The new resort opened in September last year . Seychelles is a year-around destination. All seasons are great for diving and fishing while sailing and snorkeling is optimal from October to June. The spectacle of migrating birds can be seen in October while the heaviest rainfall is often from December through February.